Concerning paint brushes, I would like to know which one is most preferred. Is 12 bright a good choice? Does anyone recommend a specific type? I was once told, that one should lechatchila avoid using non kosher animal paint brushes. Many fine paint brushes bristles are made from hog. Great topic! Let me share the process I utilize in sealing batim. After the batim are sewn, I apply synthetic glue (super glue) around the cut and immediately place the batim on a press. Once dry and the glue cured (best after the next day) the base of the batim is sanded down to the leather. Any corrections in the squaring of the base should be taken care there. Likewise, any remaining gaps along the previously glued cut should be filled in by using superglue and inserting ground powdered leather (treated leshem keddushat tefillin) into the small remaining holes. The superglue hardens upon immediate contact with the leather forming a solid bond. For best results, sand immediately after applying ground leather into the superglued gap. The above step may need to be repeated a few times in order to fill the remaining gaps. This is necessary in order to insure a perfectly smooth surface after sanding. If one is not particular about this, whatever paint is applied afterwards over it will telegraph, thus reveling the uneven surface of the underlying leather. Let me note another important point. I have many times checked tefillin were the gaps appear to have been smoothed with some sort of gray looking putty. This is not proper as whatever material used in closing those gaps should be from the same type (i.e. of leather origin). The glue should also be from kosher animal origin, however our Rabbis have permitted the use of synthetic glue. Once sanded and squared properly, I apply approximately seven coatings of paint to the base of the tefillin housings while allowing it to dry between each coat. The next day (2 days even better for the paint is even harder), once the paint is properly dried and cured we give it the final sanding. I like to work with 320 grit wet/dry sandpaper and then finish it to a mirror smooth surface with an extra fine 600 grit. sandpaper The process is time consuming, and certainly worth more than the $40.00 charged for a segurah. However, I take pride in making them look as beautiful and perfect as I can. Where do you get the ground leather? do you make it yourself? I tried superglue a few times, but found that after a few months, the charitz developed a whitish discoloration each time so I switched to elmers. What brand do you use? One can obtain the ground leather from the factories were they make batim. At the time they are trimmed, one can find mountains of leather dust which is already processed Leshem Kedushat Tefillin laying on the ground. Just grab a bag and fill to your heart's content. As to the glue, I use Loctite liquid (not gel). It is made of "Cyanoacrylate." Cyanoacrylate can also be obtained in larger industrial sized containers from other manufacturers. In Israel, one may find it in some of the STa"M suppliers at Mea Shearim or the hardware store. As to the whitish discoloration, this is a non-issue if one uses it in combination with the ground leather and then sands down prior to painting. 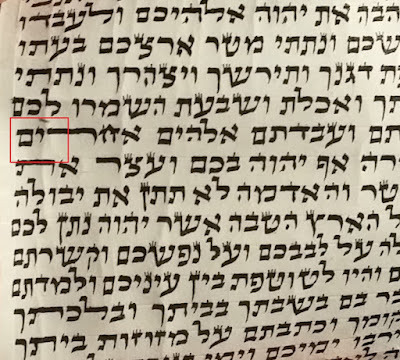 I have never experienced such a discoloration, but imagine it possible if the surface of the bayit was painted without allowing the glue to properly cure. It may be a problem unique to the gel - I will have to try it at some point. Thanks! I would like to point out that it is important the top and bottom be held together by gid and not with glue.Hence the batim should be cleaned and clamped "before" sewing you may then proceed to filling priming and painting.If you see the gid bubbled into the air -Your bayis is being held closed with glue not with gid. Now to methods-there is a substance called "merek" it is a very thick paint that can be used to fill in gaps and is mixed with the paint already,however it takes longer to dry than paint.A bayis closed properly should have minimum gaps you may scrape some of the hardened paint off the walls of the can(above the liquid paint)and fill those cracks. If you need the tefilin in a rush you can put a heater 2 feet away from the tefilin on low-it should hasten the drying process. That's my usual solution. I fill with the thick stuff, dry, and then sand everything down. Works well, but is very messy. Good tip on the heater. It appears to me that one has to be careful in using the above method, particularly if the ribua of the base is affected by the gap. In such case, the Bayit needs to be made of "Or Behema Tehora." If one fills it with hardened paint, merek, or devek alone, this squareness is being completed by a foreign substance and may indeed pose a problem. I don't understand why you are concerned with filling the gap with the thick paint. You have mentioned a few times in the comments that it is important that only leather made lshem kdushas tefillin be used and nothing else. I would like to make a few points. 1. The batim need to meet all standards of ribua BEFORE they are ever hermetically sealed. 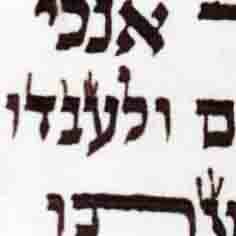 Whatever is added to fill in the gap is ONLY for cosmetic reasons and serves no halachic function whatsoever. If anything, they may make the tefillin less kosher if you take into account the opinion of the Chazon Ish who says that the glue is mevatel the tfiros and makes the tefillin passul. 2. M'mah nafshoch. If you hold that the glue does not make the titura into guf echas, then it doesn't matter what you fill it with. If you hold that the glue does make it guf achas, and therefore it is important that the material be kosher for tefillin, then the tefillin are passul since the tefiros serve no purpose at all. Wouldn't the merek concave quickly through time since it is not so strong (as opposed to super glue)? The batim paint is laquer based and highly carcinogenic R"L. Always paint in a well ventilated environment, use safety gloves and goggles. Ideally you should have a painting booth with exhaust fans as well as air purifiers. If you think I'm being over the top, google laquer thinner and cancer H"Y. Good point. Please be extremely careful and guard your health. Cyanoacrylate (super glue) also has similar carcinogenic effects as laquer thinner. The same goes for fixative sprays. Preferably work outdoors or in a place where air is quickly exchanged. Besides a goggles a nose/mouth mask is a good practice. Never leave the tefillin to dry in the same room that you are working. The fumes can eventually make one ill, Bar-Minnan. I have an outdoor table under a roof where I paint and leave tefillin to dry, and still I must say my nose and throat always get irritated. When sealing batim I use hide glue mixed at a one part hide glue granuals to one part water. I melt this in a double boiler over low heat until it has the consistency of honey. It's extreme melt strong, and is made of the exact same material as the batim, cow hide. This means that it flexes and reacts to environmental fluctuations in heat and moisture in the same way as the batim themselves. This factor significantly reduces cracking along the seams. I also don't use the regular bottles of regular tefillin for the reasons R' Eli mentioned namely extreme toxicity. Instead, I have found that oil paint made with lampblack, linseed oil and say 2% of beeswax to do very well, even better than the lacquer based paint. The linseed oil binder forms a tough, flexible film that tends not to crack for a very long time. If desired this paint can be made glossy by leaving out the beeswax and adding say 4% gum dammar. 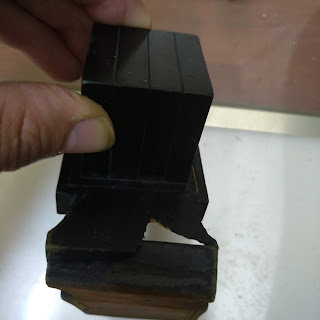 I think that given the extremely carcinogenic nature of lacquer thinner and the less than satisfactory performance of tefillin paint over time, we are well advised to research and implement better and safer paints. Sometimes the person that sealed the tefillin puts in so much glue that it fills some of the holes. I have to re drill the holes again.